It’s another Lara Wendel masterpiece! Mercilessly stinking up the joint in such bottom feeding Italian horror movies as Zombie 5: Killing Birds and The Red Monks, Lara now applies her special brand of standing around looking dumb and sounding even dumber (thanks to the obnoxiously dubbed voice with an accent as ugly as the wardrobe everyone subjects us to throughout), to this haunted house movie from noted Italian master Humphrey Humbert. Humphrey Humbert? Now, that doesn’t even sound like a real name let alone an Italian one. Could good old Double H really be an assumed identity for someone else? Someone who was also fond of making stinky Italian horror movies in the late 1980s and early 1990s? 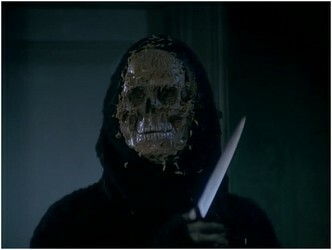 Someone who also made similarly-looking cheese such as Hitcher in the Dark and Black Demons? Umberto Lenzi, you’re not fooling anyone! Well, Lara may have been fooled, but other than her, it’s all painfully obvious that you didn’t want to sully a reputation built on cannibal and zombie flicks like Eaten Alive, Cannibal Ferox and Nightmare City with this hauntingly awful tale of a girl and her clown doll that kills hapless people who wear too much denim. But is this a good “Umberto Lezni as Humphrey Humbert” film? If by that, what you mean is “does the movie present us with characters we instantly hate and then graphically kills them off giving us a brief instant of satisfaction” then yes, I think it does quite an adequate job. I mean, when that one kid who ran away from her school to join her brother, his girlfriend and another guy to set up and operate a ham radio at a haunted house out in rural Massachusetts got chopped in half, I softly hissed “yes!” And when that one guy took a fan blade to the throat, I felt really relaxed by it all. By having his characters dress in mint green shirts, wear denim jackets, denim skirts, and vests of various materials, Humphrey, err, Umberto was able to establish them as people you just couldn’t wait to see waxed in the most inhumane ways possible. And that’s without even mentioning their hair! Like most movies of its ilk, Ghosthouse begins with a prologue that takes place twenty years before where a little girl kills a cat on her birthday which causes her dad to lock her in the basement with her cursed clown doll that he took from a corpse while working at a funeral home. How clichéd! Before you know it, light bulbs are bulging and exploding and this guy gets murdered along with his wife. Back in the present, Paul and Martha pick up a strange signal on the ham radio he plays with and is able to use his 1987 computer to track where it originated from to the house where those murders happened. This one plays out just as you would expect it to with lots of nonsensical and unexplained stuff happening just because Umberto thought it make a good scene. Ghost dogs, floors that collapse and dunk people into liquid that looks like watery paste, heads spinning in washing machines and a guy in a black cloak with a maggoty skull for a face all make appearances without any explanation. If you’ve seen any of these other Lenzi movies of the era or any of those scuzzy Lucio Fulci TV movies like The House of Clocks, Touch of Death, or Sodoma’s Ghost, you’ll know what to expect as far as the technical level of this thing. The movie is as unattractive as its “stars” and it’s apparent that no one in front of or behind the camera cared a bit about what was happening. Inexplicably followed by a couple of alleged sequels, Witchery and Beyond Darkness (titles may vary depending on where you live), one of which manages to feature both David Hasselhoff and Linda Blair!